*Note - This is a homebrew 3E conversion. Borne upon infernal winds, the dragon Iyutha glares down at the Demon City with a heart full of venom. She loathes love and harmony and stability with every fiber of her being. Even the discordant streets of Hell contain too many of these things for her to know joy, so she pits herself against the order of Malfeas in every way she can encompass, employing politics and intrigue and force of arms to undermine the city’s fiefdoms and cast them down into chaos. 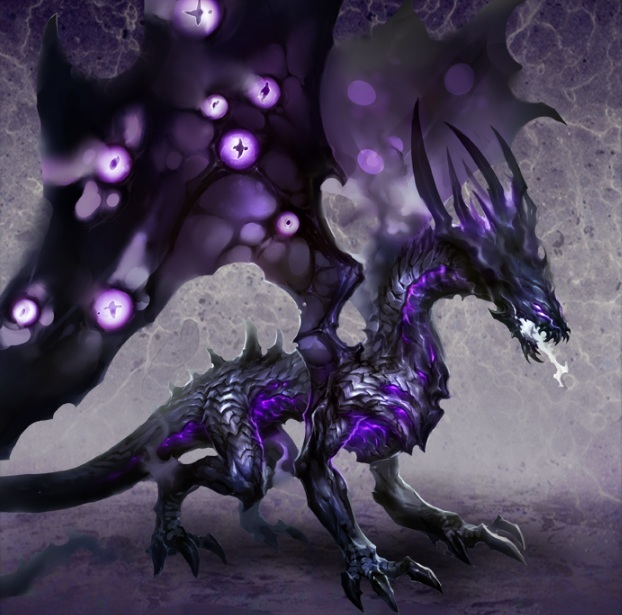 When she takes flight to spit vitriol upon her foes and rend their towers with talons of black iron, Iyutha appears as a dragon scaled in ebon and purple. Jagged bone spikes jut through her skin, and her transparent wings ripple with horrifying phantasms and ornately blazoned blasphemies. When she would wreak subtler harm, she becomes an ugly crone with fingernails of rusty iron. Entering a rival’s court, she worms her way into the ruler’s inner circle with honeyed words, then pours poisonous advice into his ear. Meanwhile, she spreads rumors and lies throughout the court and the general populace, encouraging treachery and strife. Only in watching her efforts yield the fruit of betrayal does she sincerely smile. Bleak omens accompany the Vitriolic Dragon when she appears in Creation. A greasy haze obscures the day, and stars wander from their constellations at night. Sheep abandon their shepherds, and cattle break from the herd. In the South, lions quarrel over their kills, while fleets in the West lose their bearings as compasses randomly spin. Jackdaws and kingfishers circle above palaces and ministries, presaging misfortune for the great. Iyutha serves as brood mother to a score of aerial demon species and countless Demon-Blooded offspring, but she is no loving parent. Meddlesome and cruel, she employs her progeny as pawns in her efforts to destroy her enemies. Hatred comes naturally to her, and her adversaries are legion, comprising all who have ever given her offense over the Ages. (Obscurity 2/5) Some sorcerers conjure Iyutha to ravage their foes with claws and vitriol, while others call her forth to poison the hearts of their enemies’ courts. She sometimes wrests herself free of the demon prison when the cruelty of a tyrannical parent or elder drives a child to parricide. For each month she does not betray someone whose trust she has won, she gains a point of Limit. To destroy love, beauty and order. Terrifying Vitriolic Presence: Anyone who looks upon the vitriolic dragon is treated as having a Minor Tie of fear towards it for purposes of social influence rolls. Principle of Motion (10m, 1wp; Reflexive; Instant; Essence 2): Iyutha moves with blinding speed, taking a flurry without the usual restrictions—it can flurry two of the same action if desired, and it ignores the usual penalties to dice pools and Defense. Infernal Might Unleashed (2m+; Reflexive; Instant; Essence 4): Iyutha may add up to three successes to any roll at a cost of two motes per success. If she is either upholding an Intimacy, spending Willpower to add a success to the roll, or paying for a Charm that enhances it, she may instead purchase up to five successes. Destructive Force (3m or 1i; Supplemental; Instant; Essence 1): The vitriolic dragon adds three bonus successes on a feat of strength to destroy an object or obstacle. Bane Weapon (5m; Supplemental; Instant; Essence 3): Attacks supplemented by this Charm do aggravated damage. If the spirit’s attack is useful against objects,it instead ignores the object’s soak and Hardness. The limited nature of this Charm deserves special mention, as aggravated damage is particularly dangerous. There is no All-Encompassing Bane Weapon Charm; every spirit with Bane Weapon can inflict aggravated damage only upon a narrow range of creatures. Iyutha can only deal aggravated damage to her most recent sworn enemy or most recently gained negative intimacy. Materialize (50m, 1wp; Simple; Instant; Essence 1): A pool of brown muck mixed with vitriol starts to grow until a small pond of the toxic liquid is present. Iyutha grows into her physical form, up and out of the vile liquid. Measure the Wind (5m; Simple; Instant; Essence 1): Iyutha is able to read the nature of anyone who is the victim of a deception or is involved in armed conflict. Form Reduction Technique (1m; Simple; Essence 5; Keywords: Shaping; Duration: Indefinite): Iyutha assumes an aged mortal form. The spirit compacts its substance into a smaller shape; this shape doesn’t usually have traits or significantly useful qualities that the spirit could not otherwise call upon—it thus becomes the lesser creature in all respects, and could be a lower-Essence spirit, mortal, animal or any other living thing. This Charm can’t emulate specific creatures; it mimics certain types of creatures or creates new ones. Unlike other Eidola, Form Reduction Technique actually remakes the spirit in every way that matters. No senses, spiritual or otherwise, will perceive the spirit as anything but what it’s become. This isn’t an Illusion effect. Short of extrapolation based on considerable knowledge of a given spirit—its exact speech patterns, for instance—there’s no way anyone can figure out the deception. Picking up those subtle cues requires a successful (Perception + Occult) roll, suffering an external penalty of the spirit’s (Essence + Occult + Conviction). Weather Control (10m; Reflexive; Essence 3; Duration: Essence hours): The spirit manipulates nearby weather in a seminatural way. For the first scene, the spirit “mildly” affects the weather within a one-mile radius. The next scene, the spirit intensifies the weather within this zone by one level of severity (see chart), creating a “mild” zone around that for another mile. This continues till the weather reaches its maximum radius: one mile per Essence dot. The spirit need not intensify the weather to expand its radius. Excellent thaumaturgy or a spirit with greater Essence and Weather Control could both counteract this Charm. Spirits who commonly regulate an area’s weather have the appreciation of Heaven’s Celestial Monitors of the Seasons and Weather. Others, without such permission, might attract the Bureau’s ire. Essence. These effects are permanent. supersedes the effects of Elemental Expression (see p.
element as though it were a much more useful material. then it remains after the Charm expires. element. This soak counts as armor. with its element, rolling (Wits + Conviction) to hit. favor of one element, Celestial Incarnae or Primordial. Curse guidelines (see p. 165). the above effects; some can use two or three. she suffers as if she missed (spirit’s Essence) days. against by the target’s Dodge Mental Defense Value. to perceive any of the spirit’s attacks against him. Defense Value against this attack. The spirit finds what it seeks in the target’s mind. besides Intimacies and Motivation, such as a memory. Mind-Knife Sacrament reshapes the target’s mind. which requires either restraining the target, or trust. Dodge Mental Defense Value may defend against. lose access to those powers. successes per dot to add or remove. the Intimacy, or a similar one, to bestow it. • Priesthood costs five successes. debt per normal for training effects. weapon, the target automatically rolls (Wits + Integrity). suffer a -1 external penalty to this roll. negated successes still damage the target. descending destinies caused by Sidereal astrology. The target is marked by the spirit’s sigil (though the mark may only be visible to senses that penetrate the immaterial) and can give orders in its name. She’s much less likely to be attacked by the god’s inferiors, and may spend one Willpower to call upon the Mandate of Subordination (see p. 169) and give an order that such an inferior must follow, as long as it’s seen the signet on the target. with an external penalty of the spirit’s Temperance.